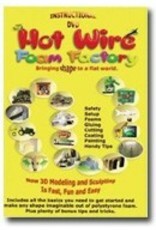 This brand new 17 chapter 90 fun filled foam minutes instructional DVDshows you all the basics you need to get started immediately and make just about any shape imaginable out of polystyrene foam. From precise architectural shapes, to freeform miniatures, to huge shapes. The best techniques for painting and gluing, plus tons of handy tips. This DVD comes free with many of our kits!